A Quest Complete – Where Is My Spot? Many years ago, shortly before finishing college, I bought my first non-disposable pen. It was a Pelikan rollerball. 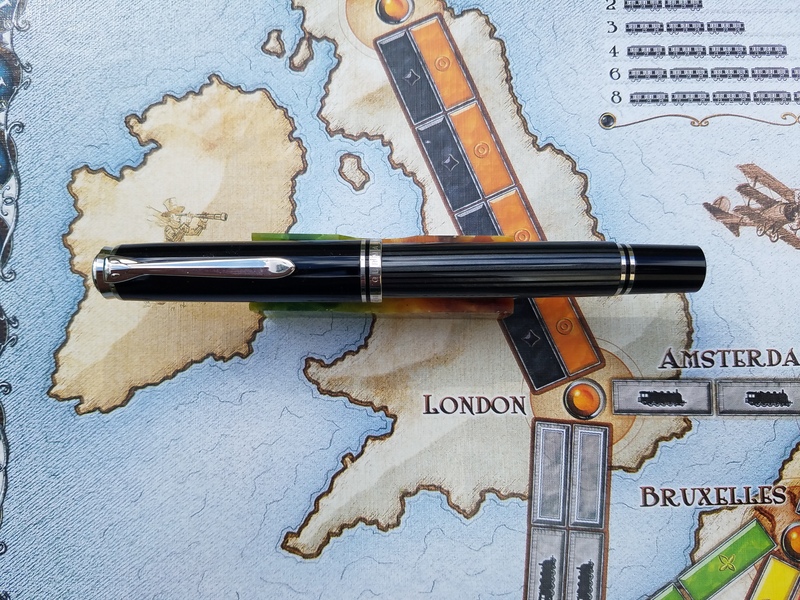 I’ve been unable to figure out what the model was, but it was a slim pen bought for around $60. I loved that pen. 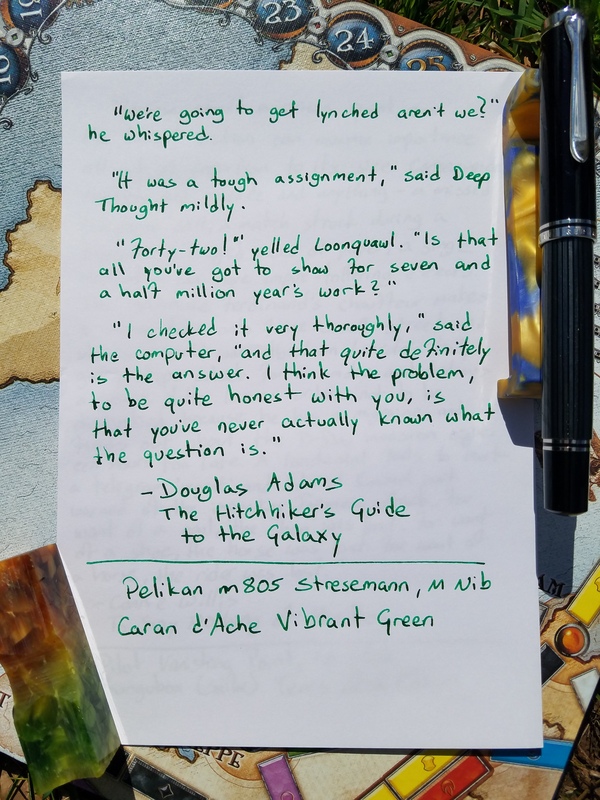 I wrote almost every day with that pen for many years, and when it became difficult to find Pelikan refills at my art store I took my first steps into the world of pen stores, and looking for pen supplies online. Sometime during the packing, moving, repacking and moving again that came with my divorce, I lost the pen. I got a couple other rollerballs but none of them ever measured up to that first Pelikan. Then I started to develop RSI in my arm and hand—that’s when I first delved into fountain pens. Since then I’ve had it in my mind that I wanted to find the right Pelikan fountain pen, to recreate the feeling I had when I wrote with that first Pelikan rollerball. I’ve tried a few Pelikans. The m215 was a fantastic pen, but it was just too small for long sessions. I’ve owned a few versions of the m200/205—several have left my hands as gifts to family, and I still have a blue one, but it’s still not the Pelikan I was looking for. A few years ago I tried a higher end Pelikan—the m640 Everest—but the shape of the barrel, and the too-light weight, are the reasons that one only stuck around for a few weeks. Then recently I found a very good price for the m805—online and overseas. I’m doing my best to keep my collection the size it is now, so to make room for this purchase I sold 2 other pens that just didn’t get much use. Then I had to decide on the color. That was tougher than I thought. I was generally leaning toward the red, because I just don’t have any red pens; but even though I’m not generally a fan of black pens, there was just something about the Stresemann that was hard to ignore. I’ve now been using the pen for a couple of months with at least 4 different inks. The Souverän series, to my eyes, has always looked a bit staid—buttoned-down if you will. Plain colors, pinstripes, and subtle ink windows assure the pens would look at home in any professional environment. By sticking to a monochrome palette, the Stresemann accentuates this, and intentionally tried to bring to mind a pinstripe suit. The pen looks classy—dressy, even—but it is somewhat plain. The only quibble I have is that I don’t understand the design choice to make the piston knob a slightly smaller diameter than the tail end of the barrel. It creates a small but noticeable ridge—that catches both the eye and the hand—and seems completely unnecessary. Pelikans have a reputation for a solid construction. Examining the m805 demonstrates why that reputation exists. Every detail of this pen exudes precision. The logo on top of the cap is aligned toward the clip. Even though you can’t see it, they took the time align the nib and the clip when the pen is capped. The piston moves smoothly, and there’s no wiggle or give in the knob. The brass piston mechanism, gives the pen a good, but not excessive weight. I have looked closely and found no faults. Pelikan pistons are widely regarded to be among the best in the industry. It’s definitely the easiest and smoothest piston mechanism I’ve ever encountered, and as it’s a fairly large pen, the m805 holds a good amount of ink. I wavered between scoring the nib as a 9 or a 10. The first time I filled the pen, it was Caran d’Ache Vibrant Green. This is one of my two tester inks, because I use it so frequently that I feel that it helps me judge a pen, without unknowingly judging the ink as well. And for the same reason I always use Rhodia DotPad to test any pen. And right away I had a problem with the pen skipping. I wrote for a while to see if it worked its way out, and it didn’t. So I cleaned the pen with pen flush, but that didn’t work either. So I tried a different ink, and the problem went away. I’ve tried 2 other inks and haven’t has the same problem. After going online I found a hypothesis that some Pelikan nibs are so smooth that with certain pen/paper combinations there’s just not enough friction for consistent flow. And while I can’t confirm that scientifically, I have only had the problem with that particular ink, on that particular paper, and only when the pen is at certain angles—which leads me to believe that in this case the proposed theory is true. With any other pen/paper the nib has been a dream—butter-smooth, with just a tiny bit of softness (or spring if that’s how you describe it). This pen does what I hope every pen does—it disappears. When writing I don’t think about the pen at all. The only thing that stopped me from giving it a 10, was the specific-circumstance-skipping that I detailed in the Nib section, above. The size and weight are as perfect, for my tastes, as I have found, and the super-smooth nib extends the time I can write before fatigue kicks in. 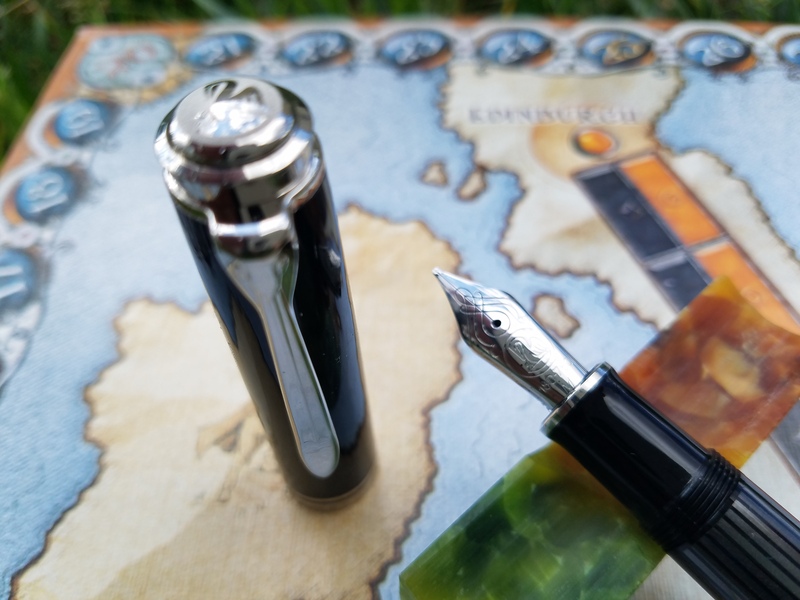 After a good bit of looking, I have finally completed my Pelikan quest that began back with that first Pelikan Rollerball.